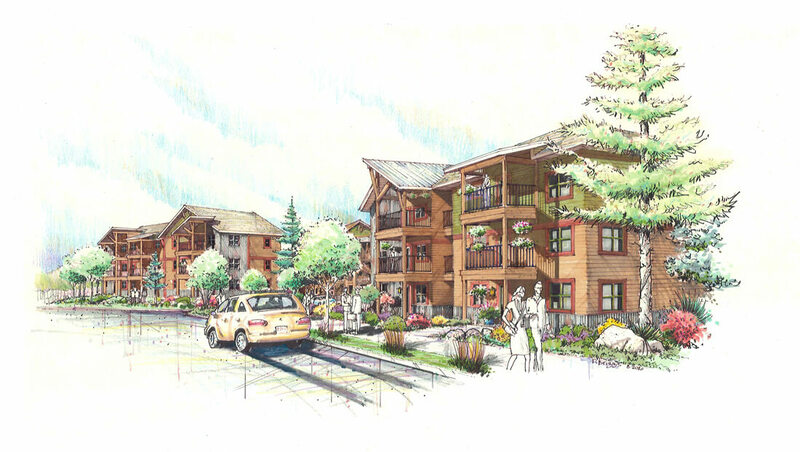 The drawings shown here illustrate a proposed 100 unit residential development near Flathead Lake and Glacier National Park in western Montana. The ‘eye level’ perspective and the two single building elevation sketches represent a portion or ‘sample’ of the multi building development. The intent here was to convey the general design character, scale, materials selections and colors proposed. Two overall complete elevation renderings delineate major views from the two perimeter avenues that boarder the property. These drawings were crucial in gaining support from adjacent property owners and used for developer and county design review board approvals as well as marketing purposes. Our summer cottage is efficient, but not at all confining or small. We have many favorite spaces. None of the areas feel crowded, even in the winter when we cannot use the outdoor spaces. The master bedroom is the perfect size with an incomparable view. Indeed, all the views from ALL rooms are beautiful! Our expectations were exceeded by your design. This letter cannot do justice to the beauty of the house.